Now that I live with MH, we take trips to Costco. I like buying their rotisserie chickens—for someone too lazy to roast their own they're a great deal, a mere five bucks for each hefty, flavorful, juicy bird. I have a whole process when I get one back to the apartment: I discard the skin; detach and set aside the thighs, drumsticks, and breast meat; strip any remaining meat off the bones; and then simmer the bones for stock. Out of one chicken I make several different meals, and practically no part is wasted. The meat I strip off the bones I usually press into panini or throw the pieces on top of pasta or greens. 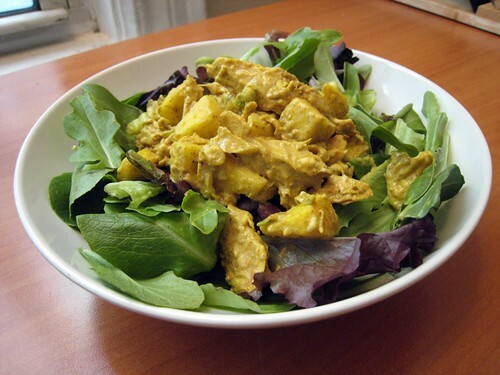 Other times, I make a curried salad. Combine all ingredients in a large bowl, and you're ready to go! Good over mixed greens, or stuffed inside pita bread or rolls for a sandwich. You can also eat the salad straight from the bowl with a fork while standing over the kitchen counter, which is what I do when I'm too hungry to be civilized.